HIS DICASTERY [i.e. the Vatican’s Congregation for Divine Worship] wishes to state that Holy Mass may be celebrated versus populum or versus apsidem. Both positions are in accord with liturgical law; both are to be considered correct. There is no preference expressed in the liturgical legislation for either position. As both positions enjoy the favor of law, the legislation may not be invoked to say that one position or the other accords more closely with the mind of the Church. This letter was sent by the same congregation responsible for drafting the 2000 (2002) Missal and GIRM, which was approved by Pope St. John Paul II. The letter was signed by Cardinal Medina, CDW Prefect, and Archbishop Tamburrino, CDW Secretary. I have no idea why so many people commenting on this issue refuse to make reference to it. BISHOP TAYLOR MADE REFERENCE to a letter dated 12 July 2016 from Most Rev’d ARTHUR J. SERRATELLI, chairman of the USCCB liturgy committee. Specifically, Bishop Serratelli said the 2000 (2002) GIRM shows “a preference for the celebrant’s facing the people.” To support this claim, Bishop Serratelli cited paragraph 299 of the GIRM … but the English translation he used was defective. 2000 (2002) Latin : 299. Altare exstruatur a pariete seiunctum, ut facile circumiri et in eo celebratio versus populum peragi possit, quod expedit ubicumque possibile sit. Correct Translation : 299. Wherever possible, the altar should be built separated from the wall, leaving enough space for the priest to walk around it and making it possible to celebrate facing the people. Some will struggle to believe an approved English translation could be incorrect. Those people should examine how the rubric “quando celebratur Baptisma” was translated in the 1970 and 1998 editions of the Lectionary. The 1970 got it right, while the 1998 mangled it horribly. A more famous example was an American GIRM adaptation for paragraph 48, which was so mutilated by the USCCB it became incomprehensible, as Dr. Christoph Tietze explained in 2006. I WILL RETURN TO THE ARKANSAS SITUATION in a moment, but first let me say that Mr. Andrew Leung’s article makes a salient point. When “ad orientem” is used in the Ordinary Form, the priest only faces away from the congregation for about five minutes total. Regarding Fr. Lombardi’s 11 July 2016 statement, I believe Fr. Mark Drew was probably correct to label it as “inept.” For example, Fr. Lombardi “clarifies” that no new legislation on AD ORIENTEM is coming in Advent; yet, Cardinal Sarah had said absolutely nothing—not one word—about new legislation. SOME HAVE ALREADY ASCRIBED bad intentions to Bishop Taylor, but I disagree. I suspect he sent his letter without knowing the CDW had specifically said the diocesan bishop cannot outlaw “ad orientem.” I believe that once Bishop Taylor becomes aware of that statement, he will issue a retraction. 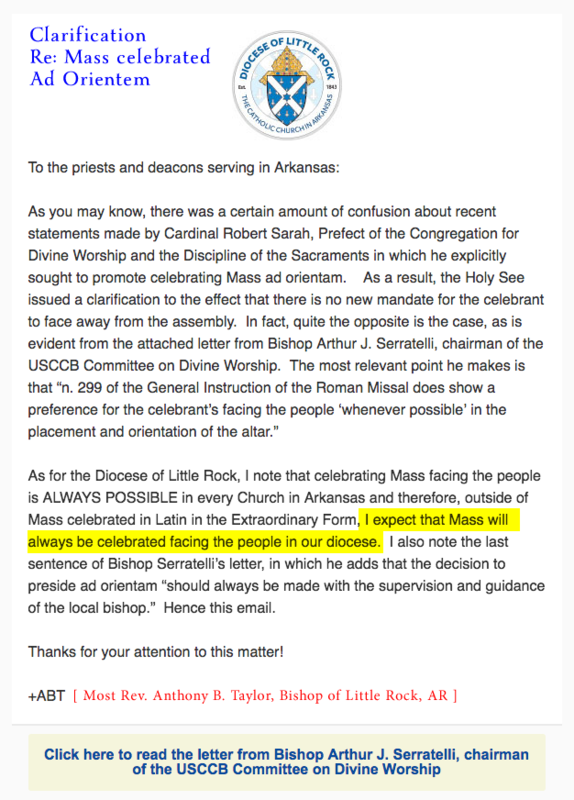 Furthermore, I strongly suspect Bishop Serratelli will retract his letter when the correct translation of paragraph 299 is brought to his attention. The reality is, everyone has deficiencies, no matter how brilliant they may otherwise be. Bishop Taylor has a doctorate in biblical theology, which has very little to do with liturgical items. That might help explain why he misspells “ad orientem.” To make matters worse, there has been excessive liturgical legislation since the 1960s: thousands of pages! If bishops want their priests to be faithful to the GIRM, why do they consistently ignore certain sections? For example, the current GIRM requires approval by the local bishop for any song replacing the Introit, Offertory, or Communion antiphon. Yet, this requirement is almost always ignored. Indeed, 85% of Catholic churches replace the assigned propers with all kinds of songs lacking approval by the local bishop—and many contain lyrics written by non-Catholics! FRENCH: (299) Il convient, partout où c’est possible, que l’autel soit érigé à une distance du mur qui permette d´en faire aisément le tour et d´y célébrer face au peuple. GERMAN: (299) Der Altar ist von der Wand getrennt zu errichten, so dass man ihn leicht umschreiten und die Feier an ihm dem Volk zugewandt vollzogen werden kann. Das empfiehlt sich überall, wo es möglich ist. POLISH: (299) Ołtarz winien być zbudowany w oddaleniu od ściany, aby łatwo można było obchodzić go dookoła i celebrować przy nim w stronę ludu. Wypada go tak umieścić wszędzie, gdzie to jest możliwe. 2 Indeed, the “Quod” clause was added in 2000 to stop the destruction of altars already in existence. This becomes even clearer when one examines the history of this paragraph.